Hey, everyone! How’s your Thursday going? Last night we started season 2 of Stranger Things and it is looking to be another good run. That and The Walking Dead are really the only shows we’re into anymore. I’m still mourning The Office, especially around Halloween and Christmas when they had some extra funny episodes. You know what other show I can’t get over? Chapelle’s Show. It was SO. damn. funny. I think any fan of it is still pissed at only 2 seasons. Why, Dave, why!?!?! hahaha okay, enough of my nonsense. Onto polish! This isn’t that much of a throwback, but it’s pre-blog so that’s good enough for me. Are you guys into the rose gold trend? I am. I love just about any metallics, but I always gravitate to rose golds and coppers. This here is Halcyon, a rose gold flakie polish by Cirque Colors and LAC My Mani? by Wet n Wild. It’s just some striping using tape and dots added with a dotting tool. Easy peasy stuff. I’ll definitely be using Halcyon around the holidays. I did a really cool metallic gradient with it that I need to find. I’ll have to scour my Facebook page, which is where I get my old school pics from. Welp, thanks for stopping by today! Halcyon always gives me pause. I almost need it. Gold + pale yellow is a lovely combo. I’ve never used them together, but I really enjoy the pairing! That’s so beautiful. So luxurious. I love the combo of the metallic with the creme. Rose gold is gorgeous on you! I need to start season 2 of ST, but boyfriend has been too tired. SOOOOOOON. This looks so Art Deco – love it! 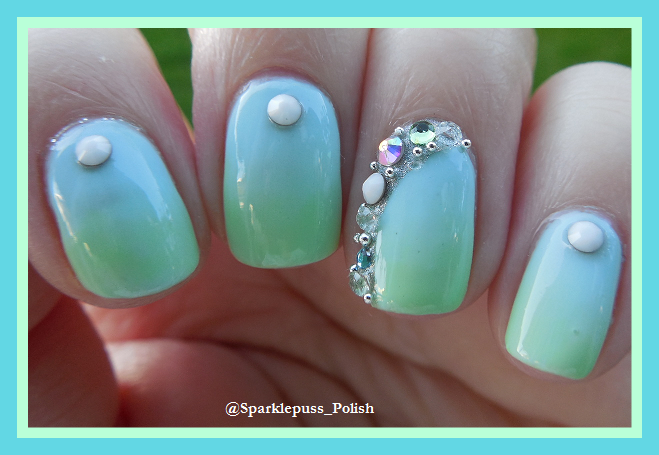 Gorgeous nail art! I don’t have Halcyon but I know it was a super popular color when it was released.